I’m sorry, but I eat these all. Every last one. So I had to make a whole new quantity( poverty-stricken me !) just so I could click a few pics. And I’ll eat this entire batch very, because let me just tell you – these are unbelievably good. I make can’t-stop-eating-these good. You might need to pay someone to hide these from you. 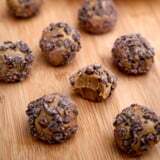 All you need is a food processor or high-speed blender, and you’ll be chewing into these soft, cookie-dough-like protein missiles in a matter of instants. Spawned with simply five simple ingredients, they smack savory enough to be considered dessert but are protein-packed, so they’re likewise perfect for a post-workout treat. At 90 calories, each protein pellet offers 3.3 grams of protein, and for less than 10 grams of sugar. And did I mention they perceive like a Reese’s Peanut Butter Cup? Oh yeah. They entirely do. If you affection chocolate and peanut butter, you have got to try this recipe. Ingredients5 tablespoons dairy-free semisweet chocolate chips 1 beaker salted roasted peanuts 1 cup Medjool years, opposed( about 10 to 12) 1 scoop vanilla plant-based protein pulverization( about 35 grams) 1/4 goblet unsweetened applesauce Directions Chop chocolate microchips with a spear and put aside in a small bowl. Add peanuts to a food processor or high-speed blender. Process nuts until a peaches-and-cream peanut butter kinds. Add times and concoction until smooth. Add in the protein powder until fully combined. Lastly, include the applesauce and assortment until a peaches-and-cream, thick dough uses. Roll dough into 22 lumps, coat each lump with the chopped chocolate, and place on a slab. Enjoy immediately, or if you like a firmer consistency, refrigerate for at least 20 minutes. Store uneaten dances in an airtight container in the refrigerator.